Immigration Minister confirms that Israel now home to world's largest Jewish community, surpassing the US. 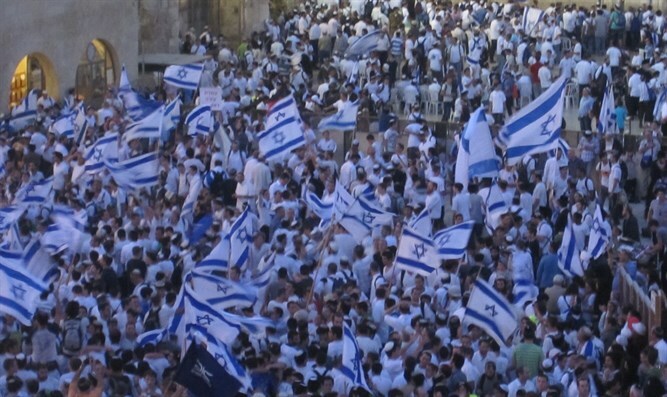 Israeli Jews now constitute the largest Jewish community in the world, a government minister said Monday, surpassing the American Jewish community by nearly one million people. Since World War II, the United States has been home to the world’s largest Jewish community. Numbering some four million people at the outbreak of the Second World War, the American Jewish community grew rapidly in the immediate post-war era, rising to five-and-a-half million by 1970. From then on, however, declining birthrates and a surge in level of assimilation slowed the growth of the American Jewish community. While the precise number of Jews is difficult to discern, and depends heavily on the methodology used and definition of Jewishness adopted, the Jewish population of the US is believed to have peaked between the early 1990s and early 2000s at roughly six million, before going into decline. By contrast, the Jewish population of Israel has increased steadily since the establishment of the state in 1948, rising from some 650,000 in 1948 to 1.8 million a decade later. By 1980, there were 3.2 million Jews living in Israel, rising to 5.8 million by 2010. According to official numbers collected by the Israeli government and provided by Immigration Minister Sofa Landver, some 5.7 million Jews now live in the US, compared to 6.6 million in Israel. Speaking at a meeting of the Knesset’s Committee for Immigration, Absorption and Diaspora Affairs on Monday, Landver discussed the demographic shift in the world Jewish community, and her ministry’s efforts to ease the immigration process for Jews seeking to make Aliyah to Israel. “We are working to reduce administrative obstacles, and we’ve increased the number of languages available in service centers,” Landver told the committee. Other figures cast doubt, however, on Landver’s claim, suggesting that the American Jewish community may in fact be significantly larger than 5.7 million. A 2013 Pew Research study on the American Jewish community highlights the difficulty in accurately measuring the number of Jews, given the variety of definitions – both from pollsters, as well as from those being polled. While Jewish tradition recognizes any person with a Jewish mother or conversion performed according to Jewish law as Jewish, such details are difficult to come by in nationwide studies. The 2013 study found that just 4.2 million Americans identified with Judaism as a religion, though nearly 1.2 million more said they considered themselves either Jewish or “partly Jewish”. An additional 2.4 million Americans said they had “Jewish background”, for a total of more than 7.7 million people with some level of Jewish identification. A 2017 study based on population estimates provided by the US Census Bureau for 2014 show the number of Jews in the US is still nearly identical to the number in Israel – and significantly larger than the figures provided by Landver, at 6,850,864. After Israel and the United States, the largest Jewish communities are in France, the United Kingdom, Ukraine, and Russia, Immigration Ministry Director General Alex Kushnir said during the meeting on Monday.